Switched On: It browsed from another dimension! Microsoft named its browser a humble explorer; Apple encompassed a whole safari. Do you get the sense that the developers of the 3D browser "SpaceTime" are setting their sights a bit higher? Most 3D browsers from the early days of the web, such as those from ActiveWorlds and Blaxxun Interactive, became best-known for avatar-based chat, in many ways the precursors of Second Life. 3B, a more recent effort, allows its users to set up web pages and photos on walls or billboards in various 3D environments such as Tech (think bridge of USS Enterprise), Beach, Lounge and what the developers call "Girly" (sort of a pre-teen girl's bedroom) presumably located in Hannah, Montana. SpaceTime, though, differs from all these avatar cyberplaygrounds, using 3D instead as a means to more visual web navigation. 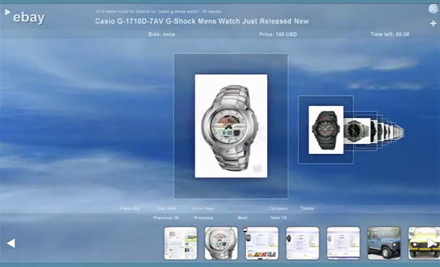 Large thumbnails of web pages float in front of a slowly drifting Cirrus cloud background; double-clicking them travels through space and brings them full-screen. Alone, this would be little more than eye candy, but SpaceTime's design goals kick in when you choose a search from one of its partners, which include Google and YouTube, Yahoo and Flickr, Amazon and eBay, among others. Searching for a term within its search field presents a series of pages or images representing the top results from the search. You can then jump from one result by clicking on the thumbnails, using the Previous and Next buttons between the thumbnails and a timeline of pages and search terms visited, or use an on-screen 2D navigational controller to move from result to result or skip ahead or back five results at a time. Using the cursor keys, by the way, lets you get "off the wire" and navigate SpaceTime's 3D environment freely. Once you figure out the scheme, SpaceTime is a fun departure from navigating with drab tabs. Its usefulness, however, varies according to task. It's most helpful with Google's and Yahoo's image searches, Amazon's well-structured catalog of products, and RSS feeds, for which SpaceTime (which is still in beta) currently offers a few canned options such as GigaOm. Searching YouTube via SpaceTime is a richer experience than via YouTube itself. As with eBay's internal search engine, though, using SpaceTime to search eBay is often less helpful since sellers often include stock photos and lace product descriptions with off-target words to attract more views. Today, SpaceTime is functionally more of a 3D search interface than a browser per se -- one that would benefit from tighter links to broader video search engines such as Blinkx or Truveo, blog search with Google Blogsearch or Technorati, and broader RSS feed support; metasearch would offer another compelling reason to use the product. But SpaceTime needs to go beyond its canned searches and feeds. In addition to the straightforward feature of creating 3D trails for sites opened via links within web pages, it needs to more tightly embrace social technologies. Already, one of the high points of SpaceTime's limited serendipity is searching Del.icio.us for tagged items. Incorporating more of a StumbleUpon dynamic would bring exploration of the long tail to its deep trails.